Situated on the banks of river Yagachi, Belur was the capital of the Hoysala Empire 800 years ago, before it was shifted to Dwarasamudram (Halebid). Today, Belur is a small town basking in the glory of one of the greatest monuments of medieval art in India-the Chennakesava Temple. A popular Jain pilgrim centre, Sravanabelagola is wedged between two rocky hills, Indragiri and Chandragiri. The 1000 year old colossal 17 metre high Monolithic statue of the Jain Saint Gomateswara Stands majestically atop the Indragiri Hill. Sravanabelagola can be approached by road from Bangalore (160Km. ), the nearest airport and Hassan(49Km. ), the nearest railhead. It is also connected by road with Bangalore 149 km, Hassan 52 km., Mysore 80 Km. and Mangalore 221 Km. Known earlier as Dwarasamudra, Halebid the ancient capital of the Hoysalas was founded in the early eleventh century AD. Deserted afterwards, Dwarasamudra came to be called Halebid or "the old capital". Of the many buildings of this ancient city, only a few have survived the Muslim invasions. Halebid can be approached by road from Mangalore (170Km. ), the nearest airport and from Hassan (32Km. ), the convenient railhead. Halebid is also connected by road with Arsikere 45 Km, Bangalore 216 Km, Belur 16 Km, Mysore 149 Km, and Shravanabelagola 86 Km. The Karnataka State Road Transport Corporation. (KSRTC) operates regular bus services from Halebid to Belur and Hassan. Chennakesava Temple :The main structure of the temple is star shaped and is a homogeneous architectural unit on a raised platform. The outer walls of the temple have a profusion of carvings which rise one above the other horizontally. Kappe Chennigaraya Temple : The inner structures of the temple have some of the most beautiful sculptured images of Ganesha, Durga and Saraswati. Places of interest include the Bandari Basti & Jain Math, a fine specimen of Hoysala architecture, the Jain Bastis on the Chandragiri Hill built in the Dravidran style and the statue of Gomateswara.The Mahamastakabhishekha festival is held here every 12 yrs. 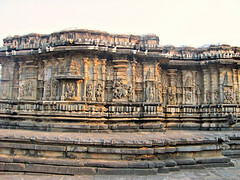 Hoysaleswara Temple: The temple has two shrines dedicated to Lord Shiva as Hoysaleswara and Shantaleswara. The most magnificent parts of the temple are its outer walls, every inch of which have been covered with friezes of amazing variety. No facets of the temple are alike. Kedareswara Temple :This temple built by Ballala II and his consort Abhinava Ketala Devi in 1219, has three super structures over the shrines and finely executed sculptures. There are a few Jains shrines dated to the twelfth century AD to be found in Halebid. Chatachattahalli (3 Km. ): Famous for the Chatteshvara Temple built in 1200 A.D. The Archaeological Survey of India maintains a sculpture gallery within the Hoysaleswara Temple premises. The museum has a collection of stone sculptures. Timings : 1000 to 1700 hrs. Closed on fridays. Bucheshvara Temple at Koramangala (6 Km. ); Yoga Narasimha Temple at Gorur (10 Km. ); Mosale (13 Km.) – famous for the twin temples of Channakeshava and Nageshvara; Sattihalli (15 Km.) - well known center of a Christian agricultural community; Channakesava Statue at Kondajji (18 Km. ); Lakshmi Devi Temple at Doddagaddavalli (18 Km. ); Lakshmi Narasimha and Someshvara Temples at Nuggihalli (36 Km.) ; Lakshmi Narasimha Temple at Holenarsipur (32 Km.) ; Kattmeswara Temple at Arsikere (40 Km.) ; Ramanathapura (40 Km.) – considered by the Hindus as Dakshina Kashi, it has a number of beautiful temples, built on the banks of the river Cauvery; Bisle-ghat (100 Km.) – with its beautiful stretch of thick, evergreen forest and scenary. Belavadi (13 Km. ): This ancient village is dotted with temples and shrines, the most outstanding of them being Veeranarayana Temple, a fine specimen of Hoysala architecture, where the idols of Veeranarayana, Venugopala and Yoga Narisimha are installed in one temple complex. Halebid (16 Km.) : Once the capital of the Hoysala Empire, Halebid is famous for the Hoysaleswara Temple built in the delicate style of the Hoysalas. Chikmaglur (23 km.) : Nestled in the Baba Budan Hills, Chikmagalur is a calm, serene town with hills, valleys, streams and coffee estates. Places of interest in Chikmagalur are, Kodandarama Temple, Jamia Mosque, St. Joseph’s Cathedral, etc. Places around Chikamagalur include, Marle (12 Km. ): It is a place of antiquity and known for its ancient temples. Renowned amongst them is Chennakeshava Temple dating back to 1150 A.D.; Ayyanakere (18 Km. ): An ancient tank situated at the eastern base of the Baba-Budan range, provides irrigation facility to more than 1500 hectares of land; Mulliangiri (28 km. )- It is the highest peak in the Baba Budan Range of Karnataka. A trekkers paradise, with a panoramic view of coffee estates and waterfalls; Bhadra Wildlife Sanctuary, Muthodi (32 Km. ); Kandya (43 Km. ): One of the five Panch-kshetras (five sacred places) situated on the banks of the river Bhadra; Balehonnur (45 Km. ): Situated on the river Bhadra, famous for the Veershaiva Mutt and the temple of Veerabhadra. Kemmanagundi / K. R. Hills (55 Km. ): is a scenic hill station, situated on the Baba Budan Hills at an altitude of 1434 mt. surrounded by thick green forests. Nearby are the Hebbe Falls and Kalhatti Falls, the water here cascades down from a height of 554 ft. & 403 ft. respectively; Amrithapura (67 Km. ): Famous for the Amriteshwara temple built in 1196 A.D.; Sringeri (90 km.) One of the four seats of learning established by Sankaracharya. Kalasa (92 Km. )- Situated on the banks of the river Bhadra, Kalasa is considered one of the Pancha-kshetras. Accom: Silent Valley Resorts, Kalasa-Kudremukh Road, Tel: 08263-4801/2, Tariff: Rs. 600-800/-, Thotadur Yatri Nivas, K.M. Road, Tel: (08269) 4699, Tariff: Rs. 100-350/-; Kudremukh (95 Km. 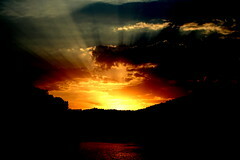 ): It is a secluded hill station at an altitude of 1894 mt. with deep valleys and steep precipices replete with fascinating natural beauty. Kudremukh is also famous for its iron ore mining industry; Horanadu (100 Km. ): Set amidst enchanting natural beauty, it is famous for the ancient temple of Annapoorneshwari. The temple devasom provides free lodging and boarding facilities for pilgrims visiting the temple; Gangamoola (110 Km. ): A hill station lies amidst thick forest. Tunga, Bhadra and Netravati rivers have their origin here. Accommodation in Chikmagalur – STD Code: 08262. Hotel Malanad Paradise, I.G. Road, Tel: 34531 / 2. Tariff: Rs. 200-400/-; The Planters Court, K. M Road, Tel: 35881 / 32310. Tariff: Sgl. Rs. 225-500/- & Dbl. Rs. 375-750/-; Quality Inn, I.G. Road, Tel: 21257. Tariff: Rs. 125-200/-; Hotel Rajmahal, I.G. Road, Tel: 22451. Tariff: Rs. 100-200/-; Taj Garden Retreat, K.M. Road, Tel : (08262) 20202/ 20404, Fax : 20222. Tariff: Std. Sgl. Rs.1700/- & Dbl. Rs.2300/-. Sravanabelagola (86 Km.) : A popular Jain Pilgrim centre. Area : 8.4 Sq.km. Altitude : 968 Metres. Temperature : Summer Max: 34°C. Min: 20°C. Winter Max: 28°C. Min: 14°C. Rainfall : 86 Cms. (June to Oct). Season :Throughtout the year. STD Code : 08177. 37 Km., Mangalore 154 Km., Mysore 155 Km. and Shravanabelagola 86 Km. Tel: 22209. Dormitory Rs. 35/- per head. Travellers Bungalow, PWD, Belur, Tel: 22348. Tariff: Dbl. Rs. 75/-. Sri Annapoorna Lodge, Temple Road, Tel: 22009 (Tariff: Dbl: Rs. 150/-); Gayatri Bhavan, Main Road, Tel: 22255 (Tariff: Rs. 75/-); Sri Raghavendra Tourist Home, near Chennakeshava Temple, Tel: 22372 (Tariff: Rs. 80/-); Sri Vishnu Lodge, Main Road, Tel: 22263 (Tariff: Rs. 125/-). Belur Road, Hassan, Tel:56065/792-3. Fax: 56794. The tariff of the following hotels ranges from Rs.100/- to Rs.300/- for a single room and from Rs.200/- to Rs.400/- for a double room. Hotel Abhiruchi, B.M. Road, Tel: 68885, Hotel Amblee Palika, Race Course Road, Tel: 66310; Hotel Apoorva, Park Road, Tel: 67153, Hotel Ashraya, near Bus Stand, Tel: 67613, Hotel D.R. Kari Gowda Residency, Tel: 64506 ; Hotel Harsha Mahal, Harsha Mahal Road, Tel:65533, Hotel Lakshmi Prasanna, Municipal Office Road, Tel: 68391, Hotel Sanman, Municipal Office Road, Tel: 68024 ; Vaishnavi Lodge, Tel:67413. Circuit House, B.M. Road, Tel: 68220. Tariff: Rs. 60/-. KSRTC Guest House, B.M. Road, Tel: 68406. Reservations: The Divisional Controller, KSRTC, B.M. Road, Hassan, Tel: 68406. Travellers Bungalow, B.M. Road, Tel: 68437. Youth Hostel, Tel: 66168. Tariff: Dormitory Rs. 40/- per bed. Hotel Mayura Shantala (KSTDC), Halebid, Tel: (08177) 73224. Tariff: Sgl. Rs.100/-, Dbl. Rs. 150/- & 4-bedded Rs. 250/-. Travellers Bungalow, PWD, Halebid, Tariff: Dbl. Rs. 60/-. Hotel Raghu, Sravanabelagola, Tel: 57238 (Tariff: Rs. 80-250/-); SDJMI Committee Cottages, Sravanabelagola, Tel: 57258 (Tariff: Sgl/Dbl. Rs. 50/- & Dormitory); Yatri Nivas, Main Road, Tel: 57295 (Tariff: Rs. 100-300/-). Sri Bhakti Guest House ; Sri Gangawal Guest House ; Sri Hegde House ; Karnataka Bhavan ; Hotel Kunda Kunda Bhavan ; Sri Mahaveer Bhavan ; Sri P S Jain Guest House ; S.P. Jain Guest House, Tel:57223 ; Sri Ratnatraya Guest House. The Manager, Hotel Mayura Velapuri (KSTDC), Temple Road, Belur, Tel:08177- 22209. Tourist Information Centre, Halebid, Tel: 08172-73224. Regional Tourist Office, Vartha Bhavan, B.M. Road, Hassan, Tel: 08172-68862.